Going forward to save money and have just a few ingredients that are relatively cheap and easy obtain at this moment I will be doing a series based on ‘areas’ in the home that we are looking to keep clean. 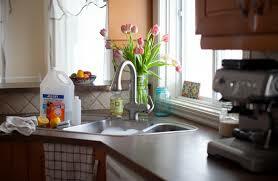 Today, we will be looking at keeping the kitchen area clean, including dishes, floors, windows, etc. Very simple and works great! Mix the Borax and baking soda together. I like to make large batches at a time and use a ‘repurposed’ plastic container with a tight lid that once held pretzels and I do keep a dedicated large tablespoon for ease of use in the container itself. Add to your dishwasher’s detergent compartment, and run as usual. I typically use about 1 Tablespoon per load of dishes in the dishwasher. Borax and baking soda are both natural disinfectants and mild abrasives – just what you need to blast away stuck on food and germs. 1. Finish using up any commercial rinse agent that remains in your dishwasher. 2. Instead of refilling with the commercial rising agent, fill the well with white vinegar. 3. Run your dishwasher as usual. 4. Refill the dispenser as needed. 1. Add grated castile soap to boiling water and stir until dissolved. 2. Add washing soda and stir. 3. Add liquid castile soap and stir. 4. Let mixture cool, then add essential oils. 5. Transfer to repurposed soap dispenser and use as regular dish soap. 1. Soap mixture will harden as it sets. If it’s too thick to pour, just add a tiny bit of warm water and give it a good shake to loosen it up. 2. The amount of washing soda you use will dictate how thick the soap gets, so adjust accordingly. The temperature of your kitchen is also a factor. I like to reuse spray bottles (you can reuse one if you clean it out well! Windex bottles or other spray bottles that had multipurpose cleaners in them, just be sure to clean/rinse well) or if you are very cautious you can buy new ones fairly inexpensively. And instead of paper towels use either washable ‘rags’ or even cut up old tee-shirts (you can buy a bag of ‘rags’ on amazon by the the pound for just under $7). Fill a spray bottle with undiluted white vinegar. Then, spray on all of your stainless steel surfaces, and wipe dry with a soft cleaning cloth. Simple and effective! To make a safe cleanser for a home marble countertop, fill a spray bottle with 1 tablespoon of natural liquid soap, such as Castile soap, (how to make liquid soap out of bar soap) and 1 quart of warm water. Shake the bottle to mix them thoroughly. Alternatively, grate 1 to 1 1/2 tablespoons of your favorite natural or organic bar soap, and dissolve that in the same quantity of water. To clean the countertop, mist it lightly with the mild soap solution and wipe it clean with a soft, damp, lint-free cloth. Use a second cloth to buff the stone dry if you wish. DO NOT USE LEMON JUICE, VINEGAR OR ANY OTHER NATURAL CLEANER THAT IS ACIDIC AS IT WILL ETCH THE MARBLE AND/OR GROUT! ALSO, ESSENTIAL OILS SHOULD NOT BE USED ON MARBLE OR GROUT AS MANY OF THEM WILL ‘EAT’ GROUT. Some acidic and highly pigmented liquids, such as red wine and fruit juices, can quickly stain marble. Remove these stains with a poultice. First, wipe the stained area with bottled or distilled water. Then mix up a thick paste of more water with an absorbent material such as chalk, white flour or kaolin clay. If the marble is white, you can use a bottle of 6 percent hydrogen peroxide for your liquid, instead of water. Tape plastic over the poultice to keep it from drying out, and leave it for 48 hours. Wipe away the poultice with water, and repeat if necessary. Dust surfaces with baking soda (just a little! ), then scrub with a moist sponge or cloth. If you have tougher grime, sprinkle on some salt, and work up some elbow grease. Just like using Comet or other commercially available cleansing powders. Keep that in mind…a little goes a long way and to avoid residue you will need to rinse/wipe well. Alternatively, I have found that you can get a 1 quart spray bottle, fill with warm water, add 3 tablespoons baking soda, 20 drops tea tree essential oil. Shake well, spray, rinse. Mix 2 cups of water, 3 tablespoons of liquid castile soap and 20 to 30 drops of tea tree or lavender essential oil. Spray or rub on countertops and other kitchen surfaces. Let sit for a minute or two and then wipe off with a wet rag. Can be used to clean the refrigerator including the seals. Do NOT use citrus oils on plastics or other porous materials as they will MELT or CORRODE them over time. Take 1/8 cup warm water and add enough baking soda to make thin paste…scrub as you would using commercial glass stove top cleaner. Do NOT use on real wood or bamboo floors!!! YES, YOU CAN USE THIS IN YOUR SWIFTER MOP OR OTHER SPRAY AS YOU GO COMMERCIAL MOPS. 1. Add all ingredients to spray bottle and shake to combine. 3. Spray cleaner on the floor (or other surface). 4. Wipe up with a microfiber cloth. 1. As with all cleaners, please do a spot test to make sure this will work on your floors! 2. For a mop and bucket version, try this: For a gallon of water, you could try 1/2 cup of vinegar, and 1/3 cup of alcohol, plus a few drops of dish soap. 3. Remember really wring the mop out so that you do not leave a lot water on the floor to ‘dry’. Sprinkle baking soda into sink and scrub out…rinse. Bonus: You also sharpen the blades at the same time!!! Garbage disposals not only get really stinky if you don’t maintain them, the blades will also go dull. Here’s is a fast and easy way to eliminate odors and sharpen the blades. Turn on garbage disposal and allow to run until you no longer hear chopping. Gently heat 2 cups per drain of vinegar in pot/pan. Run warm water to flush out. Put small amount of apple cider vinegar into small wide mouth bowls and place around known areas where the fruit flies are. Let sit for a day. You will trap them by drowning. Personally I like to use an all purpose natural cleaner to sneak up on the small bowl before they notice me and spray real quick to make the ones on the rim wet so they can’t fly and then I rinse down the sink. Repeat as needed. 1 pint mason jar or 1 recycled baby food jar, with lid if you still have it. OR plastic wrap, rubber band and a fork/skewer/toothpick if you don’t have the top. Punch 8-12 holes into the lid, just big enough for the fruit fly to enter. Big enough you can get the tip of pen into it. Get plastic wrap, or wax paper (old sandwhich baggie?) and a rubber band to tightly cover the top of the jar. Poke holes into it with a fork, skewer or toothpick. Fill the jar with about a half inch of apple cider vinegar, wine, beer or liquor. Stir in a couple drops of dishwashing soap (if you want), then place a small piece of overripe fruit into the middle of the liquid (if you have), if you do use fruit be sure that the fruit is sticking out of the liquid. Set your traps where you see the fruit flies. Empty and repeat every 2 to 3 days. You can put down the drain, compost pile, etc. Just get them gone! 1. Clean your produce as soon as you get home, and store it loose or in a new bag, rather than in the plastic bag you got from the store. 2. Cover your fruit bowl or store fruit in the refrigerator. 3. Don’t put food or beverage containers in waste paper baskets. 4. Use, freeze or compost all overripe fruits and vegetables. 5. Don’t keep any vegetable or meat scraps in your garbage can inside your home. Not only does regularly taking out the garbage keep flies away but ants and other creepies. 6. Take out your compost. 7. Wash all dishes and clear the drains in your sink. 8. Run garbage disposal regularly. 9. Don’t leave wet dishrags in the sink, on the countertops or in the washmachine. 10. Clean the seals of your refrigerator door, the top and under the fridge. 11. Clean under and around your dishwasher and stove. 12. Allow the first inch of the soil in your houseplants to dry out before watering. 13. Make sure you have good window and door screens.